The news coming out of Arizona’s Department of Child Safety remains alarming. The state’s foster care system is being pushed to capacity. There are more children in the system than ever before and the number of staff available to help them continues to decline. Recent reports show that there are still 19,000 kids in foster care, and nearly 3,000 of those children have to live in shelters, group homes or other forms of congregate care because there aren’t enough foster homes. We are still seeing too many gruesome headlines of kids falling victim to tragedies. And we are still seeing too many kids entering the system – recent reports are again showing that more children are coming into the foster system than are exiting. House Democrats have long called for more accountability and better leadership from the governor and DCS Director Greg McKay. We have to stop these crises before they occur by investing in preventative services, providing training and support for family-member caregivers and curbing high rates of staff turnover at DCS. 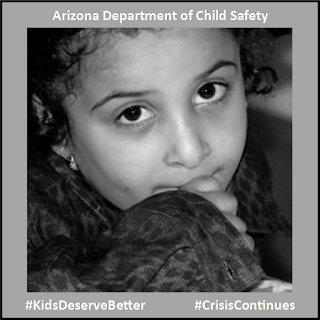 Democrats will keep working for this as long as the #CrisisContinues because Arizona kids deserve better.